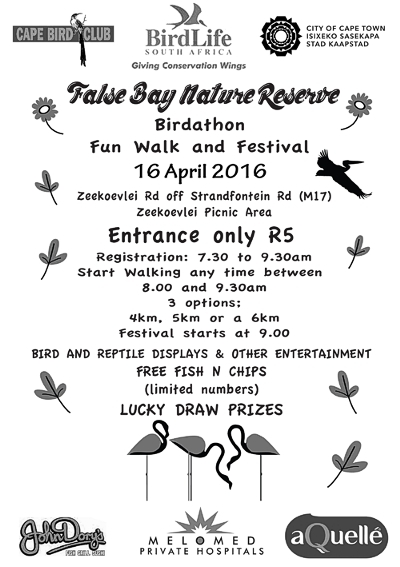 General articles associated with Zandvlei & environmental information. inspirational people and their stories. 19 Peninsula Paddle 7 - June 2016 29/07/2016. at Zandvlei by John Fowkes. 15/08/2016. 89 Recycling magazine initiative to fund Park Island at Zandvlei. 16/08/2016. A Constantiaberg Bulletin article by Karen Watkins Pg1. 11/08/2016. 85 A Rufus tailed Scrub Robin visiting nearby Zeekoevlei. 76 Constantia Bulletin article about new invasive species legislation. Fish Eagle - Detectives required.